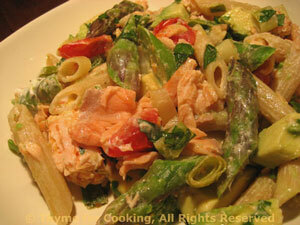 Pasta with Smoked Salmon, Asparagus, Thyme for Cooking easy recipes. Other than giving the leek a quick sauté, this is just a matter of assembling and baking. You can use any semi-soft cheese ( Brie or Camembert), but I prefer a slightly aged Chevre (goat). It normally comes log-shaped (long, round), and wrapped in paper. It will have a thin rind that is an edible part of the cheese. Slice goat cheese 1/4" (.6cm) thick, either 2 large or 6 small (see above). Trim leeks and slice thinly. Heat oil in small skillet. Add leeks and sauté until tender, about 5 minutes. 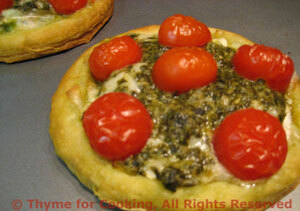 Lay out puff pastry and either cut 2 circles, 5 inches in diameter (11 - 13 cm) or 2 squares, 5" (12cm). Lay the cut pastry on a baking sheet. With a dull knife (butter knife) lightly etch around the pastry, 1/3" (.75cm) from the edge. Divide the leeks and spread within the etched lines. Spread pesto on top of the cheese, dividing evenly. Put tomatoes cut side down on top of pesto. Bake in pre-heated oven at 420F (205C) for 12 - 15 minutes, until sides of pastry have puffed around middle and are golden brown.